This week we caught up with David and Chris from VitalEyes, winner of the Faculty of Applied Science Innovation Award. The Great Hatch was exactly what I was looking for as a health professional with several health-related ideas but with no understanding of how proceed to make them a reality. It’s a fantastic environment to engage and brainstorm with students/graduates from many disciplines who together can help get a project started with amazing results. I feel extremely fortunate to have been involved in this event and I am very pleased to continue my association with the groups I collaborated with. 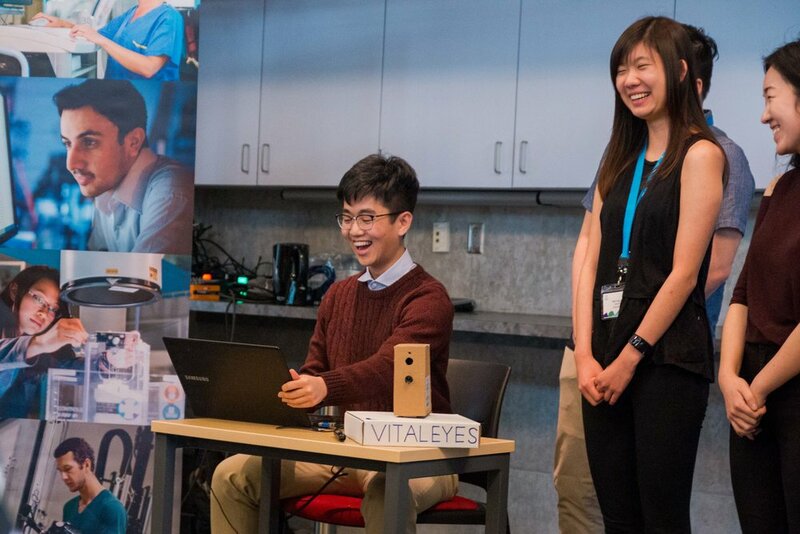 VitalEyes is a non-contact vital sign monitoring solution that detects and alerts health care professionals when patients are detected to have potentially serious abnormal vital signs while sitting in emergency waiting rooms. The original concept was to coordinate multiple modalities such as cameras and thermometers through computer vision to accurately monitor patients' vitals. Our vision was to identify and detect visual and vital sign cues of healthcare emergencies in order to make lifesaving, timely interventions. Having the opportunity to hack together a ‘futuristic’ solution that has the potential to save lives kept our team working through the night. Accurate non-contact vitals monitoring has the potential to disrupt healthcare beyond the walls of emergency waiting rooms, providing the infrastructure for further innovation and research. This excites us, which is why our team has continued working on VitalEyes after The Great Hatch. The Great Hatch helped bring together our team of engineers, designers and healthcare professionals. The event incubated an encouraging atmosphere of creative collaboration through inspiring speakers, resourceful mentors, GREAT FOOD, and the contagious enthusiasm shared by the participants, mentors, and organizers. Our engineering team is currently looking into the use of radio waves for non-contact vitals monitoring. The use of radio waves to accurately monitor heart rate and respiratory rate is well researched and promising for our setting. In the future, we see this new technology integrate and augment our original vision. We are now waiting to see if some additional grant money will come through and are looking into recruiting additional personnel with expertise in the area. The Great Hatch (or any other hackathon) is the perfect opportunity to try an ambitious project or jump into a totally new field. There’s something about working with other brilliant team members, the caffeine, the energy of the building - that accumulates into a rewarding surprise.